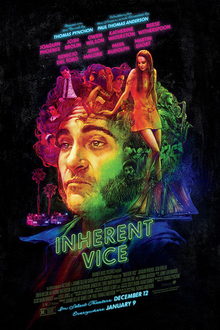 Inherent Vice premiered at the New York Film Festival on October 4, 2014, and began a limited theatrical release in the United States on December 12, 2014. Critical reception was divided; while some argued the film had a convoluted plot and lacked coherence, others praised the cast, particularly Brolin, Phoenix and Waterston. The film was nominated for a number of awards, including two Academy Awards and a Best Actor Golden Globe Award for Phoenix. The National Board of Review named it one of the ten best films of the year. Some critics have said that Inherent Vice has the makings of a cult film. In 2016, it was voted the 75th best film since 2000 in an international critics' poll. Jade leaves a message for Doc, apologizing for setting him up with the police and telling him to "beware the Golden Fang." He meets her in an alley, where she explains that the Golden Fang is an international drug smuggling operation. Doc talks to Sauncho, who gives him information about a suspicious boat called the "Golden Fang" and tells him that, the last time the ship sailed, it was with Shasta on board. Thanks to a postcard from her, Doc finds a large building shaped like a golden fang and meets dentist Dr. Rudy Blatnoyd. Inherent Vice was met with positive reviews. Critics praised the film for its performances, particularly those of Joaquin Phoenix, Josh Brolin and Katherine Waterston, while some were frustrated by its complicated plot. On Rotten Tomatoes, the film holds a rating of 73%, based on 237 reviews, with an average rating of 7.16/10. The website's critical consensus reads, "Inherent Vice may prove frustrating for viewers who demand absolute coherence, but it does justice to its acclaimed source material – and should satisfy fans of director P.T. Anderson." At Metacritic, the film has a score of 81 out of 100, based on 43 critics, indicating "universal acclaim". ^ a b Michaels, Sean (October 7, 2014). "Radiohead's Jonny Greenwood hires Supergrass to cover Inherent Vice track". The Guardian. Retrieved September 14, 2018. This page was last edited on 30 March 2019, at 02:38 (UTC).